As soon as the words came out of his mouth I knew that he was right. Images of myself at the moment of impact had been floating consistently around my mind – much more so than usual. Though often hovering somewhere in my close consciousness, thoughts on the accident—when I was hit by a car early on a Tuesday morning, one of the last days of August, 2005—felt impossibly close. I could not step away from thinking about exactly where I was one year ago—lying in a hospital cot, loopy and acting drunk due to my head trauma; later unable to move from the bed we brought into my family room for a few months, so depressed that I could not look anyone in the eye; hyperventilating in pain when my knee was jostled after surgery; my head spinning, dizzy and unable to focus my eyes; realizing that I had lost my sense of smell. And it is only now, one year later, that the reality of that past situation is hitting me in full force. That was me. That girl—that depressed, shattered girl—that was me. So it makes sense that the week leading up to August 30th was a bad one, plagued with the constant rumble of unexplained anxiety. Once realized, however, the approaching date of anniversary became infinitely easier to deal with. And I decided to honor the occasion with the only thing appropriate – a party. Jon and I, yet again, spent a Saturday morning braving the throngs of baby-strollers and nudgy couples laden with plastic bags at the local farmers market. 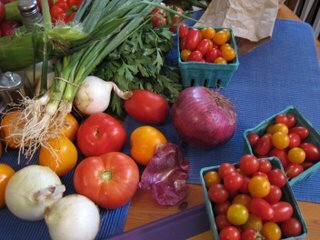 We came home bearing piles of multi-colored heirloom tomatoes, herbs, peppers, berries and plums. Unpacking our vibrant bounty, Jon examined a handful of fresh green arugula. “This smells amazing,” he said. “Give it to me,” I commanded, feeling scentishly bold. 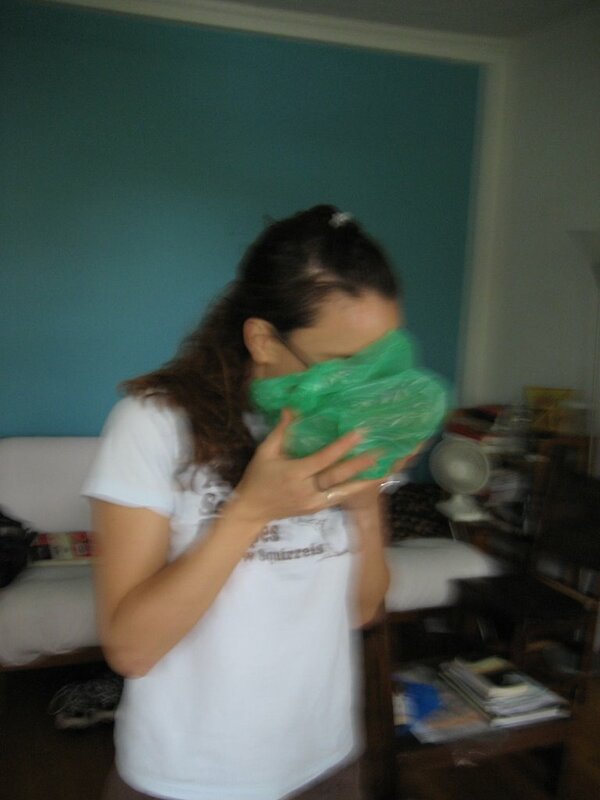 I stuck my head in the green plastic bag and inhaled deeply. Light, peppery wafts registered in my nose. A cool nuttiness. I came up for air, beaming – every new scent brings back waves of sensory images, memories I didn’t even know I had. Jon, on the other hand, was more amused by the sight of my head in a bag, hence the picture. While planning the party, I played around with different thematic ideas—my favorite being only to serve food-things that I can smell perfectly (a menu of chocolate and wine could not be all bad, if not exactly nutritionally sound) though the thought of decorating the apartment with large plastic-formed noses also appealed. In the end, however, we decided simply to begin with a small dinner gathering, with a great many more friends coming later for a less culinary-oriented party. I didn’t want to revel in what was—I just wanted to have a good time, a simple excuse for friends to come together. 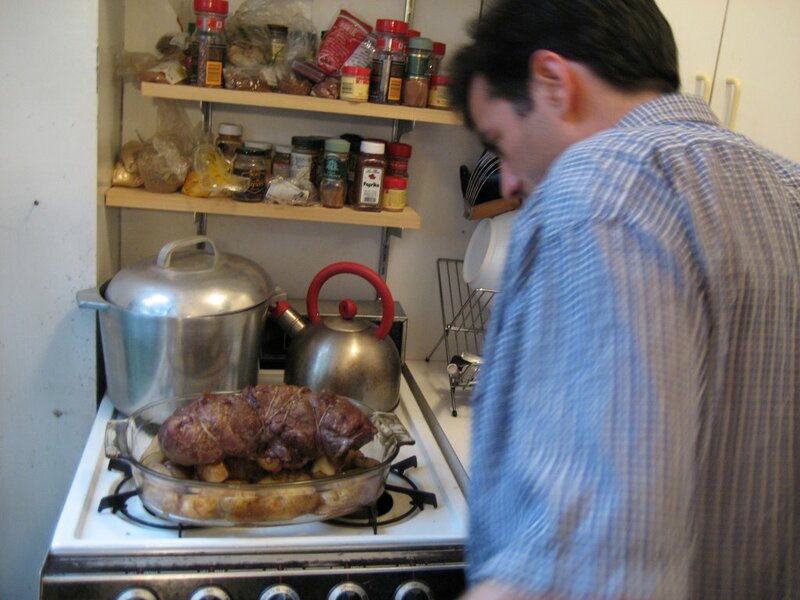 And so in preparation, Jon and I spent the afternoon cooking. Throughout, I’ll admit, there were moments when surges of anxiety came rising from the back of my throat–anxiety that continued to baffle me with its sudden onset. It was still three days before the actual anniversary date. But, in retrospect, I think that imagining myself in the week before the accident was even more difficult than imagining what came next. A year and a few weeks ago I was in Italy with my family—hiking through the gold afternoon light of a Tuscan vineyard, tasting the abundance of blackberries growing on the side of the dirt roads, inhaling the sweet fields of wild lavender, looking forward to my impending travels in France and start date at the Culinary Institute of America. Knowing the shock of what was to come is what really grated against my mind, created bulbous waves of nausea as I stood in my apartment with Jon. Cooking always helps me to relax, though. It has always been a way to ground myself. And Jon and I certainly can cook. We threw ourselves into the kitchen and created quite a feast: a puff pastry tart constructed with the pile of heirlooms, bright summer quinoa salad, tender lamb roasted on a bed of new potatoes and served with tarragon mustard, a rustic almond-plum buckle. 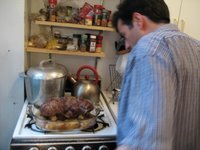 As we cooked, the scent of rosemary hovered about my head--fresh sprigs were lodged in the lamb as it roasted, perfuming the kitchen. Memory so intrinsically bound in scent, it brought me immediately back to a moment last November. I had been chopping the herb at my mother’s kitchen counter, balancing on my one good leg while my braced left knee dangled useless to the side, when I was suddenly, delightfully assaulted by its rich smell. It was the first scent to come back in full force after I lost that olfactory ability in the accident. And it was the first moment since that day in August that I thought, perhaps, I would be ok. Rosemary smells hopeful to me now. The afternoon of cooking (pervasive anxiety attacks aside) was indeed a hopeful experience. More and more I find that each time I enter into the kitchen, something has changed. As I chopped the garlic cloves and sprigs of cilantro for the quinoa salad, their smell burst into my brain in overwhelming waves. The newest of my regained scents, they still surprise me. It takes a while for my olfactory neurons and brain to register and recognize something new. If the source of smell is not right there in front of me I will stand still, breathing deeply and trying to put unattainable words to scent for a long time. The basic smell-related information hovers at the tip of my tongue. I often need someone to define for me what my olfactory neurons have forgotten. The garlic and cilantro on the cutting board beckoned with their familiar, close-to-forgotten smells; I’m happy that they still exist. 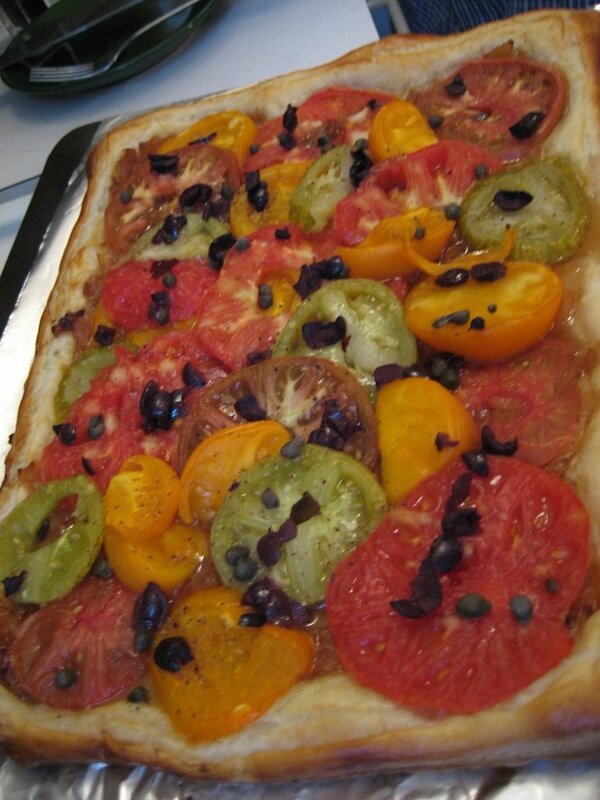 And as the heirloom tomato tart and, later, the almond-plum buckle baked in the oven the kitchen was filled with a nutty sweet warmth. Through this experience I have learned of the scent of temperature. Different than a physical measurement or sensation, there is something intrinsically olfactory about it. Try smelling a pot of boiling water; there is something there beyond the heat. It is a soothing, delicate washed perfume. In the end it was a fun evening. There was eating, drinking, friends—an excellent way to celebrate the strange and dramatic turns that I have had this year. At one point in the night I stood quietly in the sprawling crowd on my roof, and, for just a moment, watched the dappled Manhattan skyline in the distance. I felt calm and relaxed, for the first time all day. Anniversaries can be rough, as this city is clearly coming to terms with itself. I am just happy that I could make something fun come out of an experience that was not. “If someone had told me last summer where I would be right now,” I thought, looking out at the city, “I don’t think I would have believed them.” It’s been an odd year. Heat a large saute pan, add olive oild and then the onions, 2 teaspoons of thyme, 1 teaspoon salt and some pepper. Cook for about 10 minutes, stirring often. Turn down the heat to medium, add the butter, and cook for another 15 minutes, continually stirring, until the onions are caramelized and a deep golden brown. Let cool. Put the defrosted puff pastry on a sheet of parchment paper on a baking pan. Score an 1/8 inch thick border around the sides with a knife. Whisk together the egg yolk with a teaspoon of water and then brush the mixture along the border. Spread the onions within. Core the tomatoes and slice into 1/4 inch rounds. Place them on top of the onions spread evenly. Season with 1/4 tsp salt and some pepper. 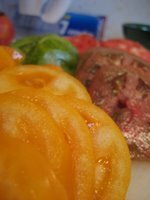 Arrange the capers and olives on top, sprinkle with the remaining thyme. Bake 10 minutes. Turn the pan around in the oven and bake for another 10-12 minutes, until the crust is a deep golden brown. Serves 8 as a first course.